One of the best theatrical experiences I have ever had is coming to New York City in March. 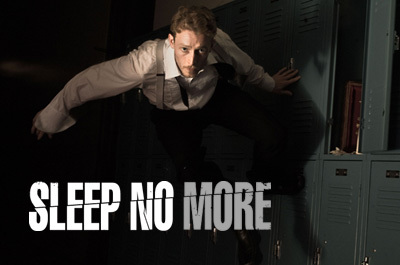 The British theatre group, Punchdrunk, is bringing it’s production of Sleep No More to Chelsea. I had the luck to see the production with the American Repertory Theater in Brookline, MA last winter and will surely be heading down to NYC to see this adaptation. Sleep No More is difficult to describe and best experienced without too much prior knowledge. It is loosely based on Shakespeare’s Macbeth with some Alfred Hitchcock thrown in (mostly Rebecca and Vertigo). Don’t expect to hear Shakespeare’s famous words though.. the production uses environment, sound, smell, music and gesture to tell it’s story. Punchdrunk describes the production as “immersive theater” and it truly is… the viewer is free to move through the experience as they wish…following characters, scenes or just exploring the elaborate set. Rebecca fans will smile as they are led into the “Manderley Bar” — here a speakeasy complete with jazz and specialty cocktails– to wait for their experience to begin. Participants are all given white masks and asked not to speak during the performance… the audience becomes one and the individual is liberated to explore in disguise. Wear comfortable shoes…you may be doing a little running. Don’t expect to stay with your friends… although it is fun to plan on meeting up every hour or so at the Manderley Bar to compare notes (if you can find it again! )… everyone will have a different experience and I met people who had been 10 times to fully explore the production. Three hours may seem like a long time but it passes amazingly quickly and you are left wanting more. I can’t say enough about this extraordinary experience! Sleep No More opens March 7th for a 6 week limited engagement at the McKittrick Hotel (a nod to both Vertigo and Macbeth’s Scottish Heritage) in Chelsea. Tickets are available now. Book one of the earlier times (entrance is every 20 minutes for each of the 2 shows) if you want to stay longer.. everyone ends together. Brush on up on your Macbeth… I found a good synopsis here. It is also a good excuse to rent Hitchcock’s Rebecca and Vertigo. And be sure to plan some time for cocktails after… you will want to discuss the experience with your fellow travelers. This one will stay with you for awhile. This show was stunning — I travelled to Boston from NYC to see it twice, last year during its extended run. Amazing. We’re going at least twice in NYC. “Sleep No More” NYC does not disappoint! The show has just been extended to June 4th so get tickets now. For those of you who saw it in Boston, the Hitchcock references have been toned down but the characters are basically the same. It seems the second Mrs. DeWinter and Mrs. Danvers are now referred to as Agnes Naismith and Catherine Campbell (a reference to the 17th c. Scottish Paisley witches). The Manderley Bar no longer bears a sign (making it even harder to find!) Copyright issues? Who knows… best not to over-analyze… confusion and disorientation just add to the experience !